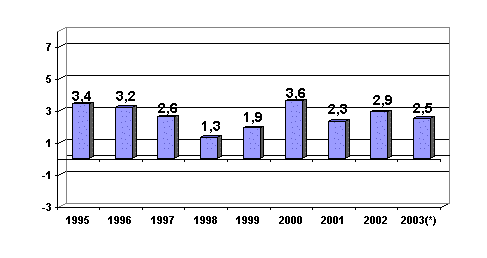 The inter-annual growth rate (April 2003 in relation to April 2002) came to 2.5%. The Construction Costs Index of the A.C. of the Basque Country fell 0.3% in April 2003, which means the inter-annual rate for the month came to 2.5%, according to EUSTAT data. The decrease in raw material costs (-0.5%) marked the evolution of the General Index in April, as the other component, labour costs, did not vary at all over this period. Over the inter-annual period (April 2003 in relation to April 2002) labour costs increased 4.0%, whereas raw material costs increased 1.4%. The drop in total costs in April 2003 is divided differently between the two main subsectors: Building costs fell 0.1%, whereas Civil Works costs decreased more sharply during the reference month (-0.8%); nevertheless, the inter-annual evolution of the subsectors saw both grow equally, as both Civil Works and Building costs rose by 2.5%. Among the raw material prices for the sector that rose more sharply in April 2003 are: Explosives and gases (1.1%), Plastic piping (0.9%) and Electric energy (0.9%). On the other hand, decreases in average monthly prices were experienced by the raw materials for Oil by products (-14.1%), Glass (-1.5%), Lime, gypsum and plaster (-0.9%) and Mining arids (-0.5%), among others.